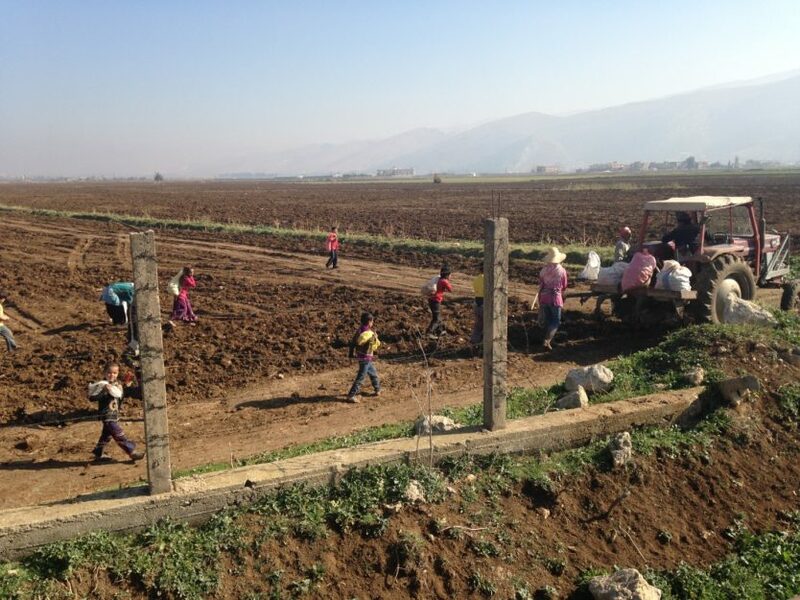 Syrian children work alongside the adults to harvest potatoes in the Bekaa Valley. January 13, 2014 – The FXB Center today released a report on the conditions of Syrian refugee children in Lebanon, titled “Running Out Of Time: Survival of Syrian Refugee Children in Lebanon.” The report examines the challenges facing refugees and urges increased funding in advance of this week’s international meeting of donor countries in Kuwait, scheduled to take place on January 15. The authors of the report, Susan Bartels, MD, MPH (Fellow and Visiting Scientist at the FXB Center) and Kathleen Hamill, JD, MALD (Fellow at the FXB Center), conducted the assessment over a 10-day period in Lebanon in November 2013. During that period they interviewed Syrian refugee families in Beirut, Tripoli, and the Bekaa Valley, as well as a broad spectrum of informed staff at local and international non-governmental organizations (NGOs) and UN agencies. Close to one million Syrians – more than half of them children under the age of 18 – have sought refuge in Lebanon since the outbreak of hostilities in their home country in March 2011, and the influx shows no signs of abating. At the current pace, the United Nations High Commission for Refugees (UNHCR) estimates the number of refugees in Lebanon to increase to 1.5 million by the end of 2014. For more details on the investigation, read Kathleen Hamill’s op-ed in The Huffington Post, Susan Bartel’s op-ed in Al Jazeera America, and coverage in the Harvard Gazette.